Gulfstream: Saturday First Post is 12:00 p.m.
Gulfstream Park will have first post of 12:00 p.m. (noon) for its 13-race card on Saturday, when it will have six stakes races. On Wednesday, Gulfstream released entries for Saturday that showed first post of 12:35 p.m. and a scheduled post of 6:50 p.m. for the 13th race. That could have led to a predicament if there were any delays, because a Florida law prohibits thoroughbred races from starting after 7:00 p.m. 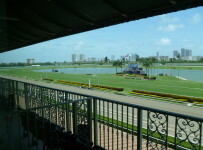 The purpose of that law is to protect harness track Pompano Park, greyhound tracks and jai-alai frontons from competition with thoroughbred tracks that are far more popular among bettors and other fans. Not being able to run Saturday’s 13th race would cause huge problems for Gulfstream, primarily because it is the final race in both the Rainbow 6 and Late Pick 5. Gulfstream resolved that problem by moving Saturday’s first post ahead to 12:00 p.m. and moving the other post times ahead. Scheduled post for the 13th race is now a more flexible 6:40 p.m. Scheduled post times for Saturday’s Gulfstream stakes races are listed below. An * designates that the race is part of the Florida Sire Stakes Series. Sixth race (2:30 p.m.) — $75,000 The Vid, 1 1/16 miles on turf for three-year-olds and up. On Friday evening and Saturday morning, we will have previews of the stakes races on this Web site. 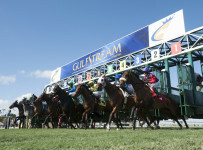 On Saturday, we will have race coverage at Gulfstream on our blog. The Sire Stakes races are restricted to Florida-bred sons and daughters of standing-in-Florida stallions whose owners have nominated and made them eligible stallions for the series. The Florida Thoroughbred Breeders’ and Owners’ Association (FTBOA) is the administrator of the Sire Stakes races.